The fall schedule of evening shows at the William M Thomas Planetarium at Bakersfield College is now posted on the Planetarium’s website at www.bakersfieldcollege.edu/planetarium . Tickets are on sale now for the first two shows. “From Dream to Discovery” will show on September 20. It gives an inside look at the engineering that occurs to create the spacecraft that travel to the planets or peer out to the farthest reaches of space. Two weeks later, on October 4, will be “Supervolcanoes”. See the Planetarium’s website for more details about the shows. Next weekend, September 7-9, is the Dark Sky Festival at Sequoia National Park. KAS will have their telescopes in the parking lot behind the Wuksachi Lodge on Saturday night (9 p.m. to 11 p.m. depending on foot traffic and the weather) for the general public to view. Other groups will have solar observing during the day along with special speakers (including two popular talks by two KAS members), a NASA astronaut talk, and plenty of activities for the kids. The cost is just the entrance fee to Sequoia. Visit the Dark Sky Festival website at https://www.sequoiaparksconservancy.org/darkskyfestival.html for the locations and times of the various activities. I hope the skies are clear of clouds and smoke! The following Saturday, September 15, is the free public star party at Panorama Park, near where Linden meets Panorama Drive, west of Greenlawn Cemetery. KAS will have their telescopes out to look at the moon, planets, star clusters, and bright nebulae that can be seen even under our light-polluted skies. Observing runs from sunset to 10 p.m. (maybe start even before sunset for the moon and Venus). See the KAS website at www.kernastro.org for a map to the observing site. At the previous public star party in mid-August, we were able to see through the telescopes hints of surface features on Mars as the global dust storm was beginning to peter out. We’re still waiting for the fifteen-year-old Mars rover, Opportunity, to call home to let us know it’s okay. Opportunity is solar powered, so we lost contact on June 10 when the dust storm blocked the sun and Opportunity went to sleep. Being without the sun’s energy for over two months could have totally drained Opportunity’s battery, damaging it so that Opportunity might not survive the upcoming winter. The solar panels might be caked over with dust. The youngest Mars explorer is still en route to Mars. The Mars InSight spacecraft passed the halfway point the first week of August and NASA engineers tested all the instruments. All looks fine for a November 26 landing in the Elysium Planitia region which is near the equator. In our evening sky, we’re still able to enjoy the string of planets arcing across the sky from super-bright Venus in the west to still very bright Mars in the southeast (see the star chart below). 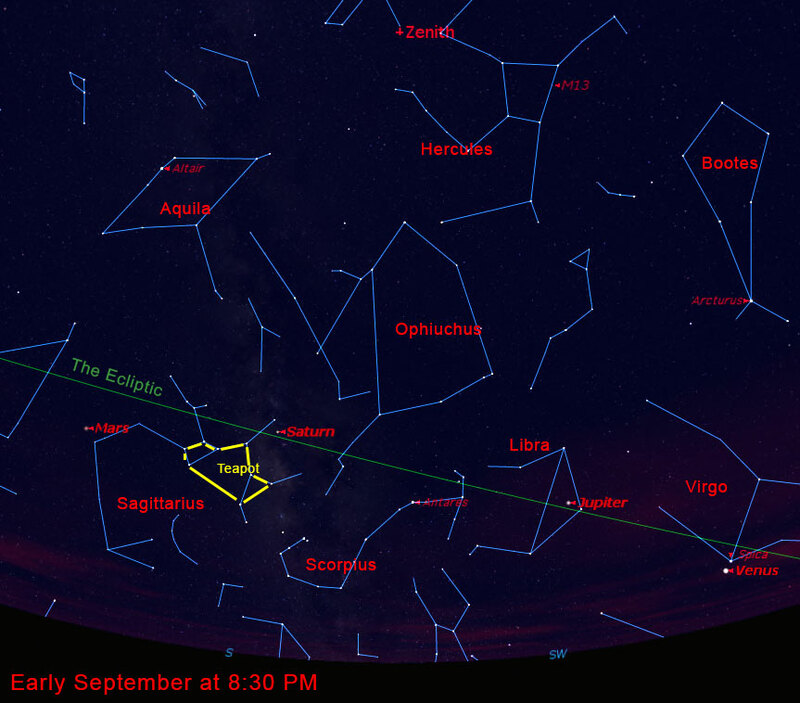 Tonight Venus will be right next to the brightest star in Virgo, Spica. Blue-white Spica is actually a double star system with the two stars orbiting very close to each other (less than one-third the distance between Mercury and the sun) with a period of just four days. The brighter component of the two puts out over 12,000 times the energy of the sun, though most of it is in the ultraviolet since it is so hot. The smaller companion puts out “just” 1500 times the energy of the sun. Because the two stars orbit so close to each other, they are tidally-stretched toward their companion into oblong shapes which caused the Spica system to change brightness slightly as they present different sides to us. Farther east (to the left) of Venus and Spica is Jupiter easily outshining all of the stars of Libra that surround it. A bit dimmer farther east is Saturn above the lid of the Teapot part of Sagittarius. Orange-red Mars is at the eastern edge of Sagittarius. The Venus-Jupiter-Saturn-Mars arc traces the ecliptic path which is the projection of the Earth’s orbit onto the sky. From our vantage point on Earth, then, the ecliptic is the path that the sun appears to take among the stars through the year. The moon will be at third quarter phase on September 3 and new moon on September 9 for the Dark Sky Festival.